How do I know what my Health Plus plan covers? The Coverage & Rates sections on our website provides detail on both the Optimum and Priority options. If you have any questions the charts don’t answer, don’t hesitate to get in touch. When you become a Health Plus™ client, you will receive a detailed benefits booklet that explains all aspects of your coverage, how your claims are paid, how to submit a claim, and other useful info. Can I sign up for just dental, travel, or drug coverage? No. We designed Health Plus to be a comprehensive plan for people without coverage through an employer. As such it is a package deal, but the best package you’ll find. However, if you already have some coverage through an employer or partner and don’t need a full benefits plan we’d be happy to look into other options for you. We’re a full-service broker with access to health insurance plans from all the top insurers. Can I top up one of my benefits? You can’t directly add more coverage to your Health Plus plan. However, if you do exceed your maximum coverage levels our Cost-Plus feature allows you to put additional expenses through the plan tax-free. Ask us how this can work for you. All annual maximums (e.g. $30 000 drugs, $750 paramedical) are set on a calendar year, which means they start January 1 and end December 31st. Certain services have a different type of limit, for example dental or vision exams, every 9 or 24 months respectively, measured from the time of service. What if I am taking prescription drugs now ... is Health Plus available for me? Yes. You may still qualify. Depending on the condition and the medication, an increased monthly rate may apply that takes into account the cost of your medication. Unlike other plans, we do not automatically exclude treatment for existing conditions. We’d be glad to review your individual situation and give you a prompt answer and quote. Can I qualify for Health Plus if I am not a Canadian citizen? Yes. If you are covered under your provincial plan (such as OHIP in Ontario) or have equivalent insurance, you are eligible for Health Plus™. If you don't have equivalent insurance, we can arrange it for you. I am not a small business owner. Am I eligible for Health Plus? Yes. Health Plus™ was designed for workers who do not have benefits through an employer. Our clients are contract workers, freelancers, independent professionals and entrepreneurs, and even students, as well as small business owners. What constitutes a pre-existing condition? How do I know if I qualify if I have a chronic illness or other health concern? The best way to know if you qualify is to call us or fill out an application (no commitment required). Some conditions may not affect your coverage at all, while some may disqualify you from the plan. It also may depend on how recent or well-managed your condition is. We’re happy to review your individual case and if you do not qualify, can go over alternative options with you. How do I enrol in Health Plus? Enrollment is simple and prompt. Complete, sign and send us your Application (Click here to apply online). We review it within a few days to confirm you qualify and notify you by email. You will receive a complete Health Plus™ information package by mail with coverage details, your drug card, claims forms, and key phone numbers. Your Health Plus™ insurance becomes effective on the first day of the month following approval of your Application. Your pre-authorized monthly payment is processed on the first of each month. What if my circumstances change and I no longer need Health Plus? 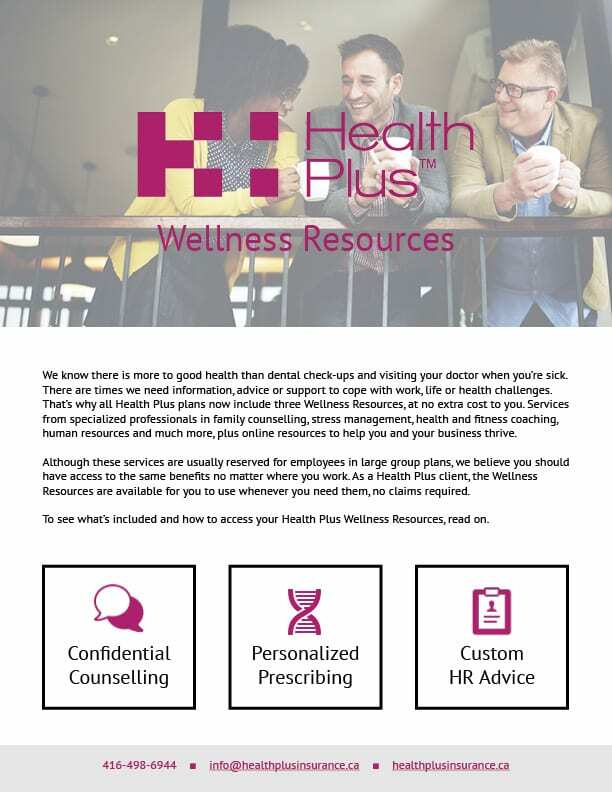 While Health Plus is portable, meaning you can take it with you no matter where you work, we understand circumstances change, you may receive benefits through an employer or partner and no longer need Health Plus. It’s simple to cancel. To discontinue coverage, you must notify us by email or by letter 30 days in advance. Terminations are effective the first of the month. For example: to stop coverage as of June 1st you must notify us by May 1st. Once your application has been approved, we will contact you to let you know. You should receive your Welcome Kit by mail, including your Health Plus ID card, within 3-4 weeks. Any eligible expenses during that time period (following the first of the month or alternate agreed upon start date) can be claimed once you receive your ID card. Should you need your ID number in advance, give us a call. How does Health Plus pay my bills? Prescriptions are paid for automatically at the drug store with the Health Plus™ card you receive with your Welcome Kit when you enrol. For dental bills, the dentist will submit the claim on your behalf and you will be reimbursed by Green Shield. For paramedical (eg. physio, chiropractor etc.) 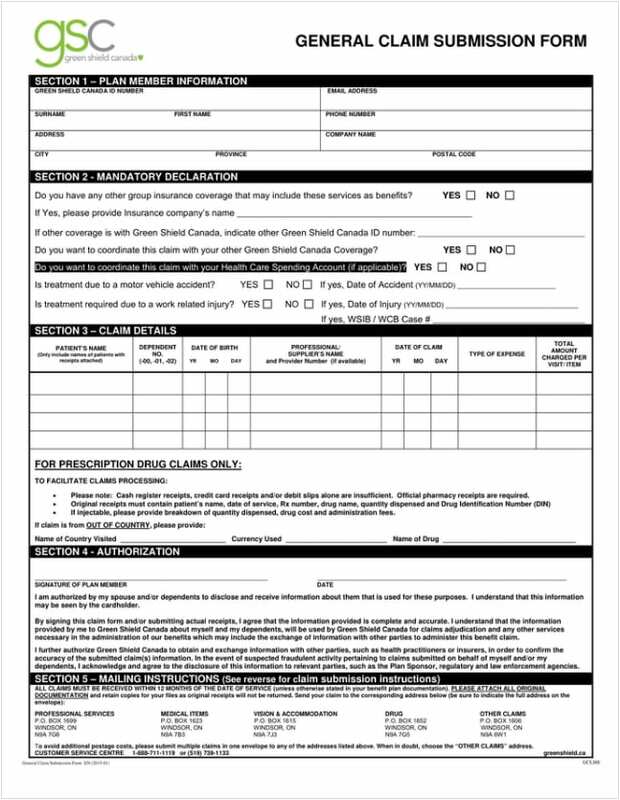 you submit your claims to Beneplan using the Claim Form you'll find in the Resources section on our website. For most other care (e.g. vision) you submit your claims online on the Green Shield website. How do I sign up for online claims? Using your ID number (found on your ID card) and pin provided in your Welcome Kit you can register on greenshield.ca. Submit your online banking information to receive direct deposit for claims. Online claims are typically processed within 3 business days and can be paid by direct deposit once you sign up online. 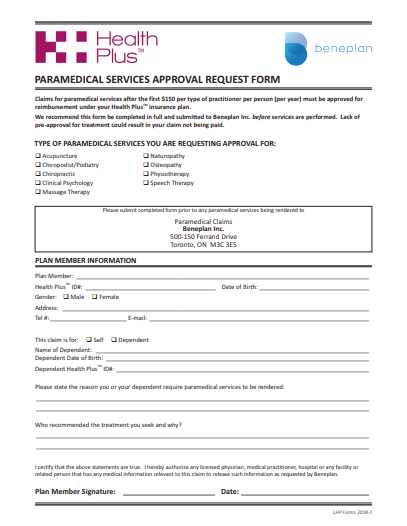 For paramedical claims or any other claims submitted by mail please allow additional time for return by mail. Can I submit a past claim? 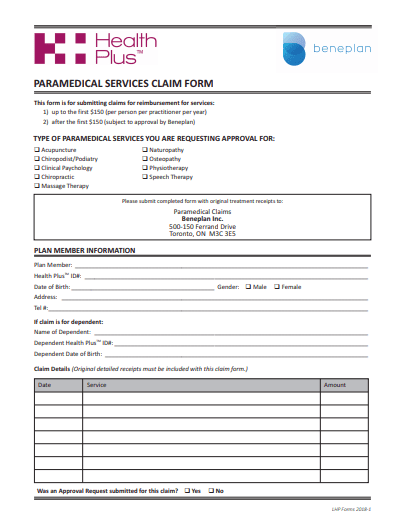 Claims can be submitted within 1 year, as long as you were a Health Plus client at the time of the expense. The exception is your travel coverage. If possible, call before receiving treatment or within 48 hours. The number is listed on the back of your ID card. My payment information has changed, where can I update it? Contact your Health Plus advisor and we will update your information. Where can I find my Health Plus ID number? Your Health Plus ID number is located on your ID card, which was included in your Welcome Kit. We get it, it happens. Contact us, and we can order you a new one. It may take a few weeks to arrive. You can continue using all services in the meantime and submit claims online or using the forms found below. If you forget your ID number, we can provide that for you too. How do I add/remove someone from my Health Plus plan? To add or remove someone from your plan call your Health Plus advisor at 877-218-0394. Any new plan members will need to submit an application. My contact information or name has changed. How can I update it? Call us to change any information such as name, address, or other contact information. Does Health Plus include life or disability insurance? No, it is not included in your Health Plus plan. However, we can definitely provide great options for life and disability that we’d be happy to review with you. We are a full-service broker and provide great options for life, group, disability, critical illness and long-term care insurance. My professional association doesn't offer health insurance yet. Who should I talk to about Health Plus? You can apply for Health Plus on your own. 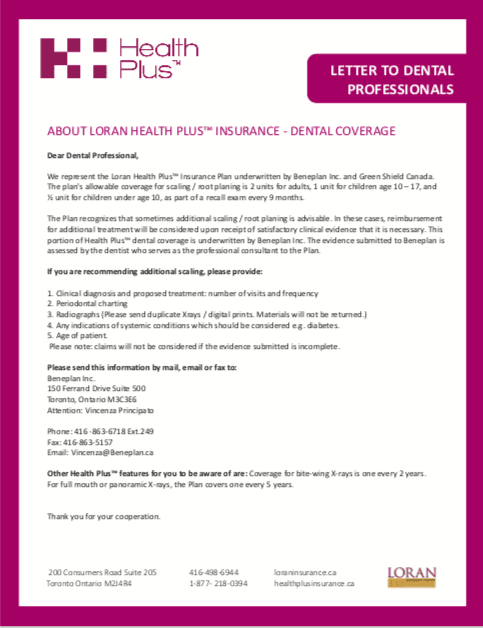 If you would like to encourage your association to offer Health Plus to members, contact us at info@healthplusinsurance.ca or 877-218-0394. You can find some of the benefits of Health Plus for Associations on our Association page.